Fluorescence correlation spectroscopy (FCS) is an optical technique that uses the statistics of photon detection to measure diffusion, reactions, and interactions of molecules in solution at very low concentrations. Following its invention in the early 1970’s FCS has become a valuable tool of biological physics, allowing direct, non-destructive and non-invasive study of biomolecules such as DNA and protein, including the kinetics and dynamics of their synthesis, diffusion, conformational changes, and interactions. The essence of the FCS method is a correlation analysis of random, temporal fluctuations in the fluorescence signal from small numbers of microscopic particles as they undergo random motion through the focal volume of a microscope. Consequently FCS teaches principles of laser optics, microscopy, Brownian motion, photon counting, and correlation analysis, as well as chemical kinetics. This Immersion will present a benchtop FCS apparatus constructed from Thorlabs components mounted on a vibration-isolation table. 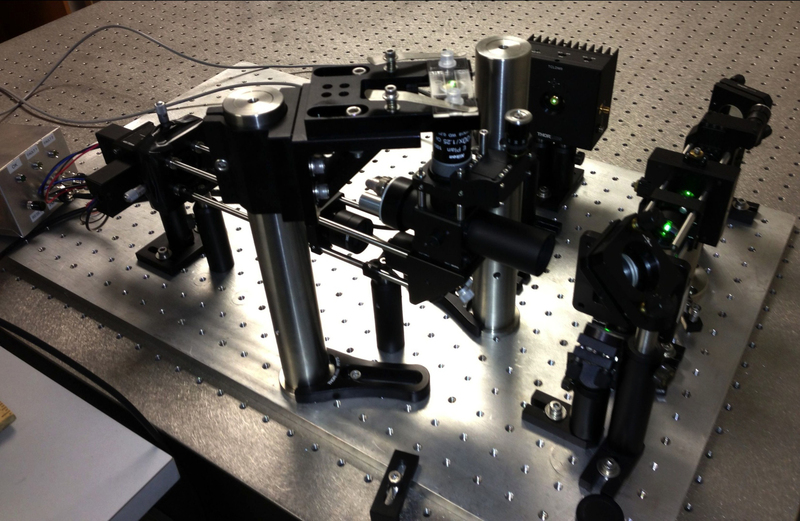 A 532 nm DPSS laser beam is focused through a microscope objective, exciting the fluorescence of a solution of fluorescently-labeled molecules at ∼pM–nM concentration within a diffraction limited volume. Temporal correlations in the fluctuation of the detected fluorescence emission from the laser excitation volume, as particles diffuse through the volume, contain information about the dynamics of the particles. To capture this signal, the molecular fluorescence from the excitation volume is collected by the objective and projected at high magnification onto the conjugate image plane, where a 50 micron pinhole is positioned in order to pass toward the detector only light from the selected focal volume. After the pinhole, the fluorescent photons are directed by a 50/50 beamsplitter toward one of two photon-counting photomultiplier detectors. LabVIEW software performs an autocorrelation or cross-correlation analysis of the signal to extract (e.g.) the diffusion coefficient of the particles. Our use of the cross-correlation approach removes certain types of artifacts and significantly improves the time-resolution of the FCS method so that molecular dynamics on nanosecond to microsecond time scales can be observed. This workshop will cover the construction and alignment of the FCS apparatus, the theoretical basis, software algorithms, and the calibration of the apparatus using a diffusion standard such as rhodamine 6G. We will also demonstrate biological application of the method by studying (e.g.) a hybridization equilibrium between two fluorescently labeled DNA strands.